Thanks to technology, it has never been as easy as it is right now, even if it still isn't exactly a walk in the park. But how long does it actually take to learn German? Is that true though? Well, as in so many things in life, the answer is that it depends. It depends on where you start from, it depends on your motivation and dedication, and it depends on how you learn. Is your teacher good, average, or completely useless (it can happen!)? Are you learning alone or in a group? Are you using a learning method that is appropriate for you? All of these things and others play a role in the time it takes any given individual to learn German. Let’s elaborate on these. If you want to answer the question of how long it’s going to take you to learn German, you’ve got to specify a couple of things. First off, what does it mean to “speak” a language? 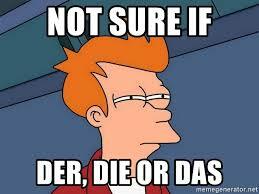 If your goal is to be fluent in German specifically, then what does it mean to be fluent in German? The level that you need to achieve and that you are shooting for is obviously tied to arguably the most important factor influencing the speed of your language acquisition: your motivation. Do you want to learn enough German to get by in Germany? Do you just feel like you need to know enough German to communicate in terms of ordering things off menus, reading signs and understanding directions, because you are going on holiday to a German speaking country? If that’s the case, you don’t need to be anywhere near fluent, since most Germans you are likely to meet, particularly younger ones and those in larger cities or places frequented by tourists will probably (and this is an understatement) speak enough English for that - for the latter it’s probably even a part of their job description. On the other hand, maybe you want your German to be good enough for you to be able to have meaningful conversations with people in their native language. Maybe you want to master the language completely because you want to study in Germany or Austria, and you want to be able to excel in your writing as well. Or maybe you are going to work with Germans, in German, so you need the credibility that comes with an impressive command of the language. The latter options are obviously harder, but you wouldn’t be the first or the last foreigner to gain a near native command of the language, and it is a very gratifying feeling. If you do something, you might as well do it right, right? Assuming that you’re interested in this higher level of fluency, that you want your German to be better than “just enough to get by”, the next thing that is going to determine how long it takes you to get there is the effort and the intensity that you are willing and able to put in as well as the efficiency of your chosen language learning strategy. If you pretty much drop everything and embark on an intensive learning programme where you are not doing anything else, you will obviously see faster results than if you put in an hour of effort and practice every now and again. This is both because of the time that you spend working on your German and the spaces between each individual session. It’s not the same thing to have some rest and get back to studying and learning German as soon as you’re fresh again than to work on it so occasionally that you forget most of what you learned the last time by the time the next session (be it a class, some time taken to do some self study or some other way of practicing) comes around. Let’s further assume that you can completely dedicate yourself to learning German for a while, even if for most people that is not a realistic scenario. The Foreign Service Institute, the training institute responsible for training United States foreign affairs employees in languages since 1947, estimates that it takes English native speakers 30 weeks of full time dedication to learn German. Devoting 8 hours a day to learning, both in conventional classrooms and in homework time, with weekends off, that’s around 7 months. This assumes 5 hours a day in lessons, Monday to Friday, plus 3 hours of daily practice (homework and self study). In total, this adds up to 750 classroom hours and 450 self study hours. That’s a lot of hours! If you compare it with estimates for the 70 languages that they offer, it turns out that German is actually one of the easier ones though, classified within the difficulty category of 2 (out of 5). Although there are easier languages for English speakers, such as Spanish, for example (approx 575-600 hours), the harder nuts to crack like Chinese, Japanese or Korean are estimated to require at least 2200 hours of classroom time! The estimates by the FSI are commonly used by many language schools to get an idea of how long students will need to learn a language as well as to determine how long each specific level should be taught for. The main problem with this approach, however, is that it uses teaching concepts that are now outdated, that were created for a different time, and it assumes that groups of students are homogenous in their previous exposure, ability and motivation. This last bit in particular is obviously not the case! The world has changed a lot since the FSI courses were developed in the 1950s and 60s and technology has also come a long way since then. We now have many more resources at our fingertips than when the FSI courses were first developed and tested. Because of this, it could be argued that the estimates produced by the FSI are more relevant as an ordinal as opposed to a cardinal value; they are a good measure of how different languages compare with one another in terms of difficulty but not so good in terms of providing a meaningful estimate of how long it will take to learn any given language. Having said this, even then their use is rather limited. For example, it hardly comes as a surprise to most people that Japanese is considered to harder to learn than German! If you are reading this, you probably speak English, be it as a native speaker or as one of the hundreds of millions of non native speakers that learn it as a foreign language. Even if you haven’t even started learning German yet, you already know more than you think. Contrary to what Mr Twain thought, German is actually not as difficult a language to learn as many make it out to be, particularly if you speak any other Germanic language (such as English) already. Especially at the beginning, words and constructions sometimes appear extremely similar (because they are!) and you should find that you can make fairly good guesses regarding what many words mean. With a little bit of time and practice, your ability to do this will only get better, even if the utterances that you’re guessing the meaning of become more complicated and further removed from standard modern variations of English. But don’t sell the proverbial bear’s skin quite yet. Just like there are some things about German that are relatively easy, there are some things about the language that are tricky. Being aware of this and not letting these things get to you and dent your motivation is important in order to stay on track. Compound words that are sometimes murderously long and can be intimidating. Just remember that you can break them down into smaller pieces and that these are often easier to understand and don’t get flustered. 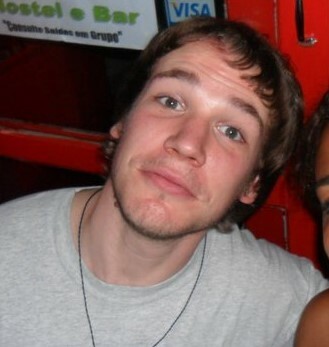 You’ll be all right. Declensions are also commonly considered to be tricky, but like many things German, there are rules for them. Just stick to the rules! The hardest bit here is that the way these rules are applied is dependent on the gender of the words, and it can be hard to remember all of them, especially to English speakers that are used to saying “the” for everything! The best thing that you can do to get over this is to make sure that you learn every word with its gender. There are some general patterns that apply most of the time, but there are a lot of them, so learning each word along with its gender is considered to be the best approach, especially at first. After a while, you’ll start to notice the patterns and new words will appear to be “logically” (at least a bit more) gendered. Grammar as a whole, with some sentence structures that appear odd at first, is usually what most people have trouble with when learning German, but just like with the declensions, everything follows rules quite well most of the time. It just takes a little bit of practice! 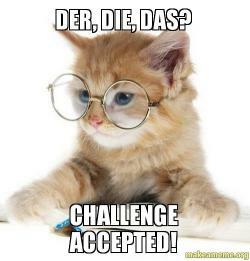 At the cutting edge of the spectrum in language teaching approaches and technology, modern, self-paced and adaptive systems such as Chatterbug are redefining how adults can acquire languages and optimising the process and the time it takes to learn German, for example. Because such systems are adaptive to each individual learner and are constantly learning what each student needs and how these needs evolve along the language learning journey, the learning process is optimised and time gains are accrued. This smart approach also means that you can take a more proactive approach and take control of your learning. 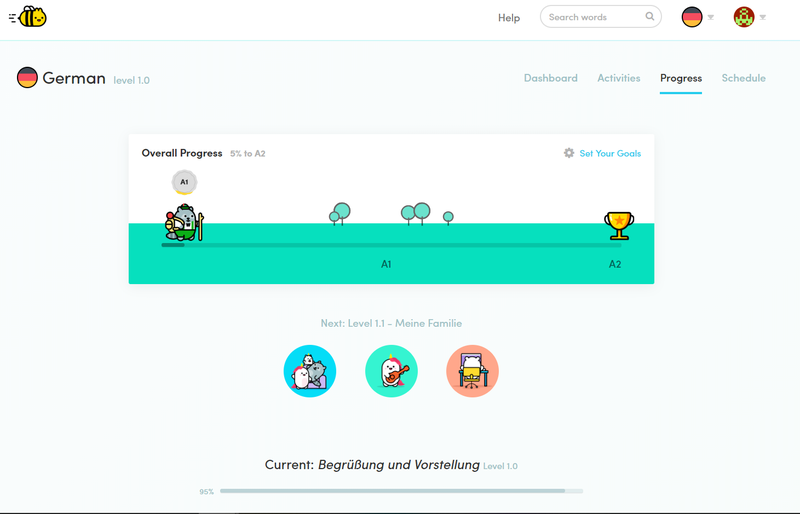 Instead of being bound to a certain schedule within a course that will eventually get you to speak German, you can set your goals in terms of when you’d like to have reached a certain level, and then the system gives you an estimation of the daily and weekly commitment you should aim for to meet that goal. By illustrating where you are in your “journey” to learning the language you also receive a visual cue to compete with yourself that contributes to keeping you motivated, because even though you get an estimate when you begin, this is a flexible one and you can beat it! German is not the easiest of languages to learn for English speakers, but it is also not half as difficult as some like to make it out to be. Traditionally, around 7 months of intensive training were considered to be enough to get a complete beginner up to a standard where they could be both functional and conversational in a German speaking context. Since previous knowledge, resources, and most importantly motivation are different for everyone though, it is hard to give a a universal figure, but modern language learning techniques make it likely that the above ball park figure (for full time learners) could be reduced. For most people, however, given that there are other things to do in life, the limiting factor will often be how much they want to learn German and how dedicated they can are willing to become. In any case, if you keep practicing on a daily basis, it is more likely that you are going to learn German in months rather than in years. Just how many months this turns out to be, depends on how much you are willing to work for it and how much you expose yourself to the language. Consistency and perseverance are your friends! It is not always going to be easy to stick to it, and at times it might feel like you have plateaued and are stuck in a rut, but it’ll be worth it. 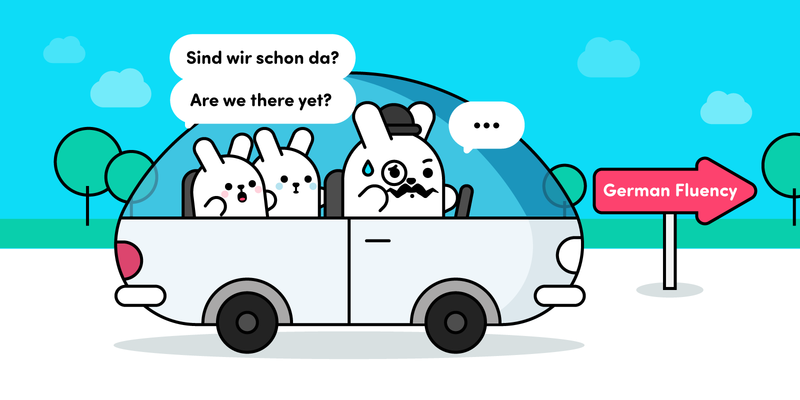 Don’t forget to have fun on your German language learning journey, no matter how long it is! Make use of as many resources as you can. Podcasts, Youtube, grammar explanation pages and our selection of curated media are all great places to start or to get some input to mix things up a bit after a while. Viel Erfolg!